Home > Little & Big Tee-sers > Little Teesers Golf Kit - Holds 8.5" x 11"
Little Teesers will not break the budget on golf tournament signs! 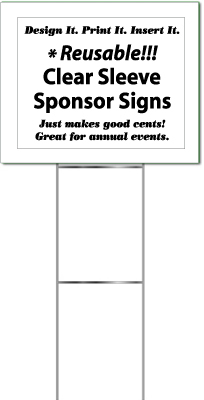 We have the solution for you - Little Teesers do the trick without a big impact on your fund raising dollars these smaller tournament signs are just the right size and price. These sign holders are perfect for our golf event each year. We print logos of our hole sponsors on letter-sized paper and slide each logo into the plastic sleeve of the sign holder. Great way to recognize our sponsors, and we re-use the sign holders year after year! As advertised, good sturdy stakes, clear sleeve shoes off sponsors well. This product is phenomenal. Everything got shipped and came in with perfect condition. The signs are super easy to use. What a great find at a great price. these are perfect for a low budget golf outing and do a great job of getting the message across to the golfers. Light weight, east to slide in the sponsors ads and all for $100! Good stuff! Thank you. Q: It holds a 8.5 x 11 sheet but, what is the total measurement of the sign? A: The size of the sign is 11"x13.5" and the stakes are 6"x24"
A: There are 18 signs in the pack and they do include the H-Stakes.